The first Indian to be inducted into the International Women’s Forum’s Hall of Fame, film-maker Nandita Das is a multi-hyphenated talent. She debuted as an actress in 1995 with EkThi Goonja and went on to work in acclaimed director Deepa Mehta’s Fire – a film that explored the lesbian relationship between two women. Manto her sophomore film was selected for screening at Cannes this year in the ‘Un Certain Regard’ section. Travelling to several festivals world over, Manto is garnering praise. It was the opening film at the Singapore South Asian International Film on Oct. 5. And is now headed to London for BFI’s London Film Festival, screening on Oct. 11 and 12. 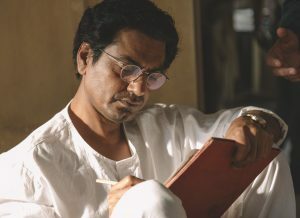 For those of us who have not read Urdu poet Saadat Hasan Manto’s works, Indian actress and filmmaker Nandita Das’s sophomore film ‘Manto,’ is quite a revelation. Das reveals Manto, his intellect and his human flaws – his beliefs and outspokenness that were reflected in his writings, his compassion for exploited women, and his love for India, despite his leaving Mumbai post partition. The film opens in Mumbai – then called Bombay – in the year 1946. Manto (Nawazuddin Siddique) is enjoying the company of writers and artists. 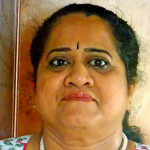 He is associated with Bombay’s film industry as script writer. Safia, his wife (Rasika Dugal) is a constant support in his creative pursuits. And, she connects well with him intellectually. When India gains independence from Britain in 1947, Manto, his wife wife and little daughter joyfully watch fireworks lighting up the sky through the bedroom window. Little does he know then that an independent India would soon be drenched in blood and violence, as communal riots drive a wedge between the two leading communities-Hindus and Muslims. Manto is aghast. He cannot understand how people who have lived together as friends can turn foes overnight. Neither is he keen on leaving India and migrating to Pakistan- the newly created nation for Muslims. What then drives him to change his mind is a simple conversation with his close buddy, the actor Shyam (Tahir Raj Bhasin). Shyam says in the course of their talk, that he, being a Hindu, might even kill Manto. It does not take long for a shocked Manto to pack his bags and join his wife, who was then visiting her family in Pakistan. In Pakistan, Manto’s life is not anything that he desired. While the country guaranteed safety to him as a Muslim, he missed the creative freedom of Bombay. The writer whose stories were brutally honest depictions about local situations became a much castigated writer. Manto was slapped with cases of obscenity in court. His compassionate stories about women, particularly prostitutes, were condemned. ‘Aren’t they part of our society?’ asked Manto. “My stories mirror society. If you don’t like the mirror, what can I do?” he retorts to the judge in court. Manto an avid collector of pens never used them to write though. He wrote with a pencil. Wrangling with editors for payment, and attending court hearings, Manto’s life in Pakistan fails his expectations. And, his addiction to the bottle further takes life downhill. Manto died at forty-two. What makes ‘Manto’ interesting is the manner in which Das has interspersed Manto’s short stories into this biopic. Dus Rupaiya (Ten-Rupees) a tale that captures a teenager’s innocence, opens the film and segues into the present with Safia reading the story. Khol Do (Open) and Thandi Ghosht (Cold Meat) are two stories that leave you with goose-bumps. Siddiqui in the title role slips into Manto’s skin effortlessly. Essaying moments from Manto’s life he portrays effectively the poet’s intellect and his human flaws. Several scenes linger in the mind. Manto is the angry poet who snubs a fan, and the loving father of two daughters, the concerned husband who decides to join a rehab centre. A chameleon actor, Siddiqui is brilliant. As Manto’s wife, Rasika Dugal juggles emotions, sharing intellectual camaraderie with Manto one moment, anguished at seeing her husband’s addiction at another, yet constant in her support for his work. Watching Manto I could not help recalling Das’s directorial debut, Firaaq a story centred around the communal riots of 2002 in Gujarat (a state in India). Firaaq, made in 2008, was a poignant portrayal of the inherent human behavior that emerged during the riots-where relationships were threatened by religion. Interestingly, Das’s acted in Deepa Mehta’s Earth, a film which was also about the mayhem and bloodshed in post-particition Lahre. Das played Shanta, who takes care of a disabled Parsi girl in that story. How do you visually narrate the life and work of a poet like Manto in a two-hour film? Das met the challenge with a meticulously researched script and recreated sets that lend the film an authenticity of the forties. Manto is a story not easily forgotten. 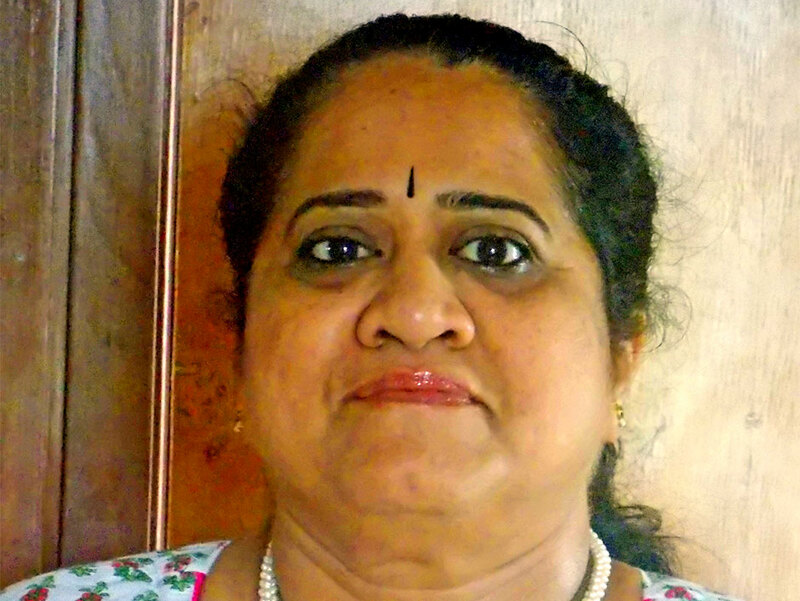 Mythily Ramachandran, a Chennai based Indian journalist, is a regular columnist for Gulf News, a leading UAE daily. When this crazy film buff is not catching up with films, she is snooping around for those little-known stories of human interest, which eventually find a place in the Weekend Review of Gulf News.